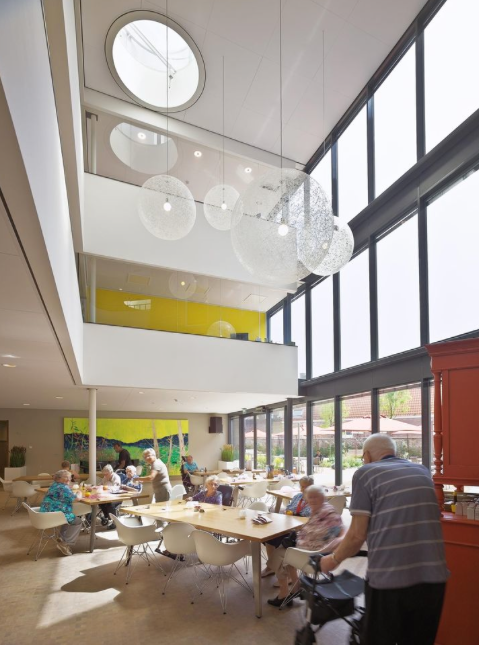 We design & build for a wide range of care needs, whether its residential, dementia or complex nursing care, and we believe our imaginative design improvements will not only lift the spirits of residents, staff and visitors, but also improve the economic performance of your business. We rethink dated interiors, often making simple design interventions that can make a big difference to residents and staff alike with modern colours, natural flooring, fresh textiles and better lighting. Good activity design helps maintain minds and bodies and encourages participation, so designing indoor activity areas and outside spaces that make residents and staff feel good about their day with things to do or just a bit of fresh air and exercise is a key priority for our design practice. To help you create a modern care home we listen first to find out what works and what doesn't. We then prepare a report based on our findings, detailing the options to explore. If appointed, we review the main plan with our architects to improve the flows and movement between areas, possibly by opening out space, or by providing more natural light in the core of the building. We link the interior to the external space with improved access, openings and landscaping. These changes are often about modifying the existing space to work better, rather than by starting afresh. Once the main plan has been agreed, our interiors team works on the design of signage, equipment, furnishings, internal colours and finishes. We believe that simple is often best; wooden floors, light walls, bright fabrics can all make a big difference. We can then tender and manage the building contract to provide a complete service from start to finish. The minimum size for a single room is 12 m2 (excluding an en-suite) in a new care home. The layout should offer space for visitors in the room and for a carer to access both sides of the bed. Purpose built accomodation also includes en-suite facilities with wet rooms or floor level shower access. We can redesign existing layouts to accommodate this. What's really important though, beyond meeting the requirements, is designing a room lift the spirits for those living and working within it; one that has plenty of natural light and also one where residents can keep their personal furniture and possessions. We don't just rethink how your internal spaces might work better, we can also help plan and refresh your communal activities. The Scandinavian model of care homes where interesting activities are widely encouraged is one that we would like to see adopted more fully in the UK. Art and craft, reading and listening to books and stories, puzzles and games are all better brain gym than just watching TV! We believe that cooking with great ingredients is a central part of improving any care home and we can offer your catering team a complete rethink in this area. Making sustaining, tasty food can also involve residents as a core activity by encouraging their participation in menu making and food preparation as well as simply being good for everyone to eat. A good interior space should maximise natural light, thus making the inside feel connected to the outside world, and also make ways to get outside feel enticing and not too difficult. Once outside, residents should be able to easily find uplifting and beautiful green garden space (something we are very good at developing with our specialist designers and contractors, with low maintenance planting). We can also help you develop a good range of outside activities, such as gardening with easily accessible high level beds.